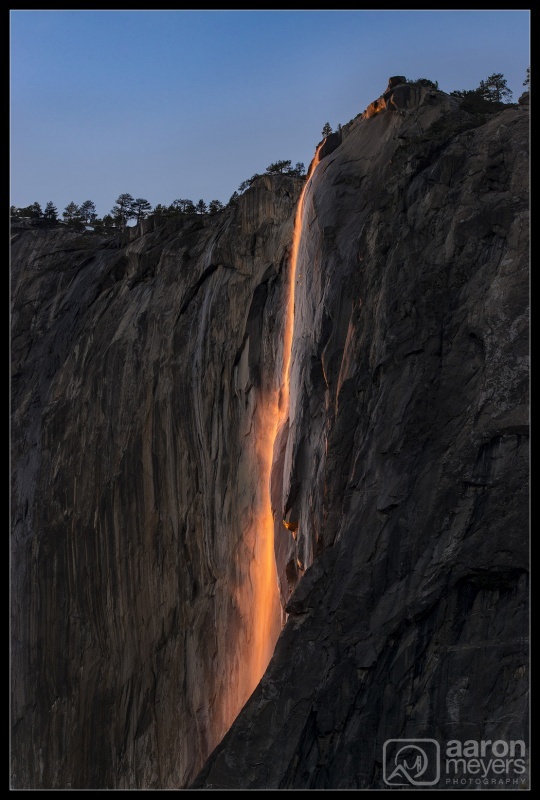 Every February theres an absolutely stunning phenomenon that occurs in Yosemite National Park: a waterfall appears as if its on fire Horsetail Falls, which runs from snowmelt off the eastern side of the giant rock known as El Capitan, hasnt existed for the last 5 years due to the California drought. But this year, thanks to El Nio, it has returned As the sun sets with its orange light, and if its located in the right place in the sky, its light reflects off the granite walls and onto the waterfall, making it look as if its on fire I last photographed this in 2011 and I was very eager to capture it again. The angle in which the sun can hit the waterfall is fairly limited, and knowing which angles will work, Im able to write a computer program every year that predicts on which days and what times the waterfall will erupt. This year, the ideal days were on Sunday, Febraury 21 and Monday, February 22. I had seen a number of amazing photos taken earlier than this but with my busy schedule, I planned on making 2 trips to Yosemite to see the Fire Falls. On Sunday, Willie, Mike, Sammi and I drove to Yosemite, rustled with the massive crowds (thanks to Social Media, thousands of people flock to Yosemite to see this), and then left in disappointment as clouds rolled in at the last minute and blocked the sun from hitting the falls. On Monday I had planned to take 8 of my SmugMug co-workers to see the waterfall and we left work at 6:30am to get to Yosemite in time. A few people hadnt ever visited Yosemite, so we left some time to explore a bit of the park. Knowing the crouds could get large, we immediately dropped off Willie and our tripods and then ventured off to explore the park. Having photographed this in 2011 from one of the two main locations (South Side Drive), I was determined to try a new angle this year: near the North Side Drive, El Capitan Picnic Grounds. For information on when to see Horsetail Falls, how to shoot it, and what the best days will be, visit my blog at http://blog.aaronmphotography.com.